Perennial herb from deep, wide-spreading roots and creeping underground stems; stems erect, glabrous, branched above, 0.3-2.0 m tall. Basal leaves soon deciduous; stem leaves alternate, lance-shaped on the lower stem, becoming broader upwards, up to 20 cm long and 7 cm wide, irregularly lobed, spiny-toothed, glabrous or green above, densely white-hairy beneath. Heads discoid, unisexual (composed of either male or female flowers) numerous, small, solitary at the ends of branches in an open inflorescence; involucres 1-2 (rarely 2.5) cm tall; involucral bracts glabrous or slightly cobwebby, outer ones egg-shaped, awl-tipped, inner ones progressively longer and lanceolate, unarmed; disk flowers pink-purple, rarely white, female ones 23-26 mm long, the male ones 12-14 mm long. Achenes 2.5-4 mm long; pappus tawny, exceeding the corollas. 1. Heads small; involucres 1-2 (rarely 2.5) cm tall; plants introduced. 1. Heads large; involucres more than 2 cm tall; plants native (except C. vulgare). 3. Leaves cobwebby to loosely woolly-hairy, woolly or nearly glabrous above, stems not spiny-winged. 4. Pappus of mature seeds shorter than the corollas. 5. Heads small; involucres less than 3 cm tall. 6. Outer involucral bracts more than 2 mm wide at base, slightly if at all hairy and if so, then mainly marginal. 6. Outer involucral bracts less than 2 mm wide at base, densely cobwebby. 8. Corollas purplish-red to purplish-pink; outer involucral bracts purplish. Mesic to dry roadsides, fields and disturbed areas in the lowland, steppe and montane zones; common in W, SC and NE BC; introduced from Eurasia. 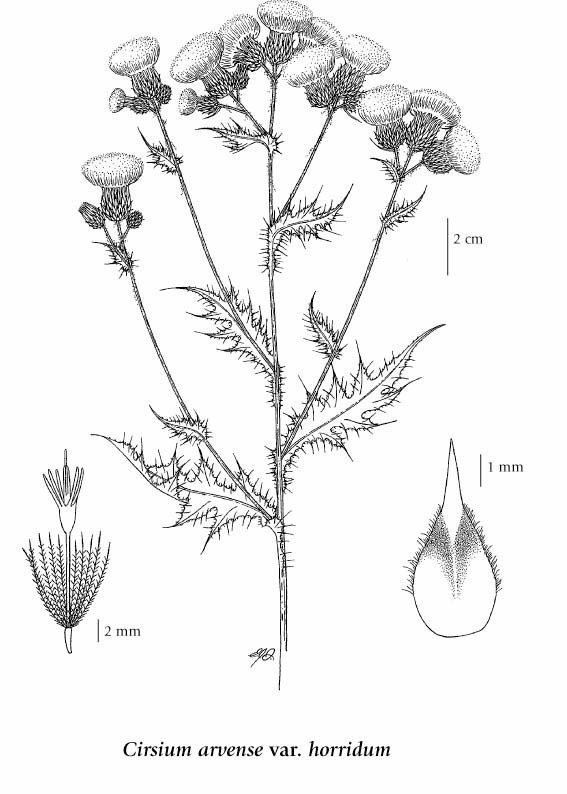 Canada thistle is our only species of thistle with separate male and female plants (Moore 1979). Moore (1979) indicates that it was introduced to North America "very early in the colonial period, probably in the 17th century". A single seedling can produce a large patch through vegetative propagation (Moore 1979). This species is listed as one of the top fourteen species of concern by the Coastal Invasive Plant Committee, for more information visit their web site. Moore, R. J. Cirsium arvense (L.) Scop. In: Mulligan, Gerald A. 1979. The Biology of Canadian Weeds: Contributions 1-32. Biosystematics Research Institute, Ottawa. There are several plant genera commonly named “thistles”, and the reason for this is they look very similar and bear prickles. The most common ones are the Cirsium and Carduus genera. When trying to identify a Canada thistle-like plant with prickles, one should first check if it is really a Cirsium, or not. The easiest way is to see if the pappus bristles have conspicuous feather-like hairs, which makes them species in the genus Cirsium, or if the bristles are missing or very tiny, which is a feature of the genus Carduus. Following that, the Canada thistle can be readily separated from the other species of Cirsium based on the small involucres that are less than 2 cm in height. However, there is another small-headed thistle, similarly introduced from Europe, that could cause confusion--the marsh thistle (Cirsium palustre). However, this species does not have creeping rhizomes, and mostly grows in moist meadows. From a distance, one might mistake knapweed species (Acroptilon or Centaurea) for the Canada thistle because of their pink flower heads and branching stems. However, their flowers are of varying sizes--those at the edge of the disk are larger than those near the center--and their leaves do not develop prickles. Note Author: Anna-Mária Csergo, February 2011. Cirsium arvense var. horridum Wimmer & Grab. Cirsium arvense var. integrifolium Wimmer & Grab. Cirsium arvense var. mite Wimmer & Grab. Cirsium arvense var. vestitum Wimmer & Grab. Cirsium setosum (Willd.) Bess. ex Bieb.